Vodafone and Telekom battled it out for first place in Tutela's latest Mobile Experience Report, which analyzed 1.55 million speed tests and over 36.2 million response tests taken from August 1st to October 31st 2018. Although Vodafone recorded the fastest average download speeds on 4G, Telekom's superior 3G network (and 4G coverage) gave it the overall fastest network. Telekom recorded the fastest average download speed across 3G and 4G networks, with its subscribers experiencing speeds of 15.78 Mbps on average, just a hair in front of Vodafone, whose customers averaged 14.47 Mbps. O2 was in last place with an average of 11.43 Mbps, although its upload speed of 6.16 Mbps was closer to the 7 Mbps that its competitors averaged. When looking at download speeds broken down by 3G and 4G, however, the picture appears a little different. Vodafone had the fastest 4G download speeds, 21.08 Mbps compared to Telekom's 20.08 Mbps on average. However, Telekom's 3G network was faster (8.24 Mbps compared to Vodafone's 7.83 Mbps), and a higher proportion of Vodafone's tests were conducted on 3G compared to Telekom, which supports the theory that more of Telekom's network utilizes 4G. O2's results were much better in the latency category, where it took a convincing lead. Latency on 4G was just 17.4 ms, nearly 31 percent better than Telekom, which recorded an average 4G latency of 25.2 ms. It should be noted, however, that all three operators recorded 4G latency averages comfortably below 50 ms, which is Tutela's benchmark for consistent quality. The report also highlights the discrepancy between latency on 3G and 4G networks, which continues to be the most noticeable difference for consumers between the two technologies. The lowest average latency on 3G was recorded by Vodafone, but even that was 57.4 ms - still double even the worst average 4G latency. Across both 3G and 4G results, Vodafone consistently recorded the lowest packet loss, with an average of 0.30 percent of packets going missing on 4G, and 1.62 percent on 3G. Both of those are below the two percent threshold where customers will start noticing problems with voice or video calls over data. 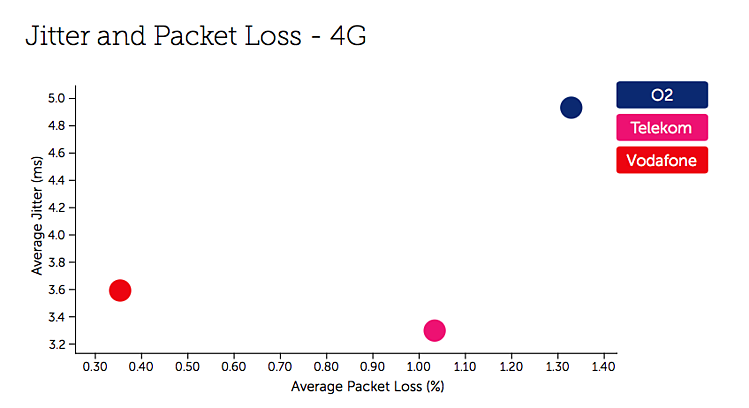 Telekom was second-best on packet loss, but recorded the lowest average jitter over 4G.